A lot of people love getting outside with their dogs; however, most people are lucky to make it to the local dog park for an hour or so. We are all animal lovers at Three Brothers Boards and we have been encouraging our paddle board and kayak tour guests to bring their dogs free of charge for many years. Paddle boarding in Daytona is a ton of fun and we have had many of our guests tell us that it was “hands down the funnest thing they have ever done with their pet.” Although it is guaranteed to be a fun time, there are a couple of things you may want to think about before you go paddle boarding with your dog. The first, and most important, thing is to make sure you have for your dog when you go paddle boarding is water. When a dogs temperature starts to rise, its body cools itself through panting, drooling and dilating blood vessels on its body’s surface in a process called vasodilation. These methods of regulating their body temperature will only work for so long and then the dog will become dehydrated and its blood pressure will drop. This will lead to a heat stroke and possible death. In fact, if a dogs internal temperature reaches 110 degrees Fahrenheit it will die in a matter of minutes, so make sure to even have a back up water supply for your dog. You will also need a life vest to keep your dog safe if they do fall in. 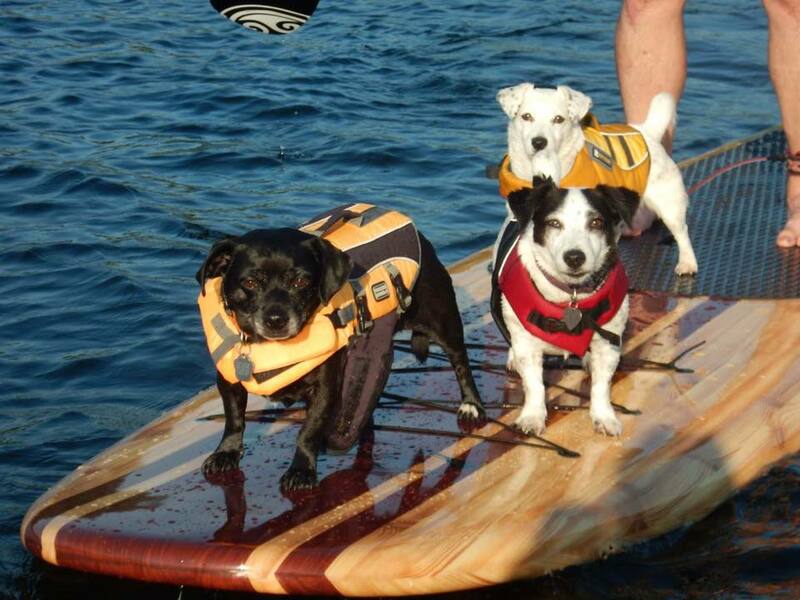 There are many different types of life vests for dogs however, when it comes to paddle boarding it is important to choose a vest with a handle on the top of the dogs back. This way if your dog falls in you can easily pick it up without falling in yourself. There are many online options for these types of dog life vest and they range in price from $12- $24. Another thing that can really be helpful for your dog is a Puppy Traction Pad. This pads have an adhesive back made to stick directly to your board in the areas that your dog would need traction. The Puppy Traction pads also allow your dog to walk further up on the board so that your dog is not always right by where your feet are. Paddle boarding can be a very fun and exciting way to get outside with your dog but it is very important to make sure that we have everything we need to have a fun and safe experience before we hit the water.